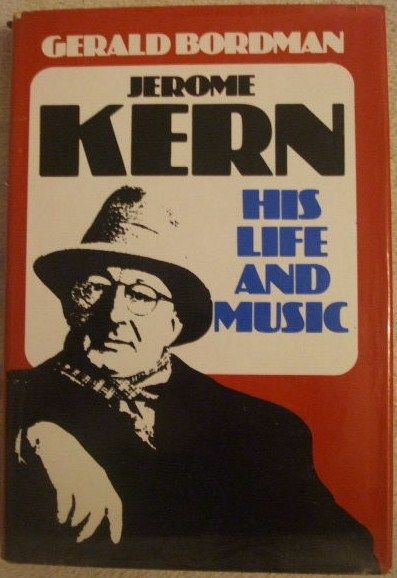 First US edition, first print hardback of JEROME KERN - His Life and Music by Gerald Bordman and published by Oxford University Press, New York, 1980. The book is in very good condition (clean red cloth boards and gilt lettering on spine which has slight creasing to the spine edges) with slight wear to the pictorial dust jacket, which is not price clipped (light creasing and rubbing mainly to the top spine edges, slight chipping to the spine edges, two tiny finger nail tears at the edge of the spine and a tiny closed tear near to the bottom corner at the back). Internally, the pages are clean and tight, there are no tears and no inscriptions. "In what has become the biography of the father of American musical theatre, Gerald Bordman demonstrates a keen understanding and sympathy for Kern the man, as well as Kern the musician. No "rags-to-riches" folk hero, Jerome Kern grew up on the periphery of the American-Jewish elite, achieved early success, and moved throughout his life among the era's leading personalities and performers. Bordman follows Kern's career from its beginnings on Broadway and London's West End before World War I to his death in 1945. He reveals how Kern's 1914 hit They Didn't Believe Me established the pattern for the modern popular ballad; how his famous Princess Theatre shows during World War I helped end the dominance of European musicals on Broadway; and how with Show Boat he initiated the Americanized operetta style that dominated the American stage for decades. Examining the scores for all of Kern's shows and films (including fascinating discussions of such famous songs as Look for the Silver Lining, Ol' Man River, and Smoke Gets in Your Eyes), Bordman demonstrates not only how Kern dramatically changed perceptions of what theatre music should or could be, but also how developments around Kern influenced him and his music." 438 pages. Illustrated with black & white photographs.